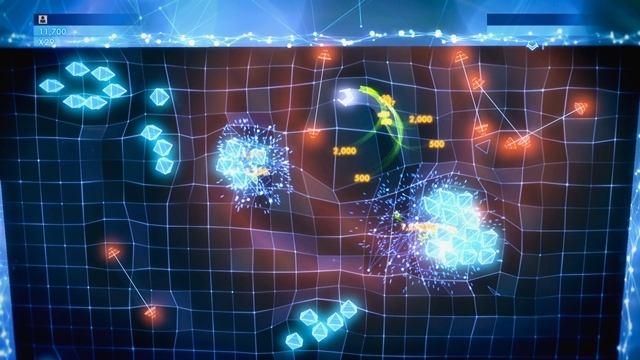 Geometry Wars 3: Dimensions was developed by Lucid Games and published by Sierra. It was released on November 26, 2014 for $14.99. A copy was provided for review purposes. 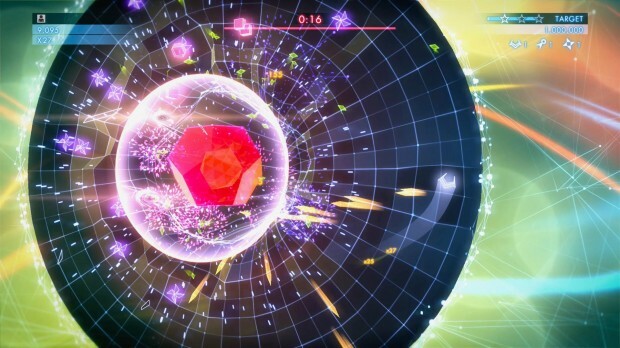 Geometry Wars 3: Dimensions is a punishing experience. It will destroy what faith you have left in yourself as a gamer. It will force you to try over and over in vain as you continue to fail. 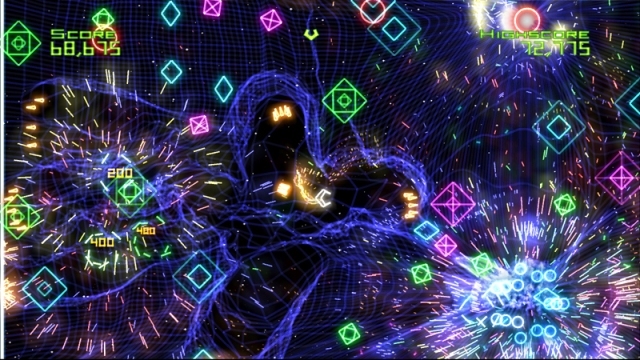 But just like Geometry Wars: Retro Evolved (and its sequel) on Xbox Live Arcade, Geo Wars 3 will keep you coming back for more. True story: I bought my first HDTV and an Xbox 360 after seeing Geometry Wars: Retro Evolved for the first time. So obviously, I’m a fan. 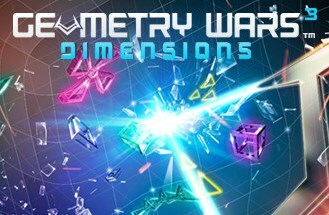 Geometry Wars 3: Dimensions improves just about everything in the original and adds a ton of new content. This is the third game in the series (not counting Geometry Wars: Galaxies on 3DS/Wii U, since most people don’t seem to count that game for whatever reason), and the first by new developer Lucid (and published by the recently resurrected Sierra). It is both a trip back in time and a look forward. What has stayed the same? Your little ship-like shape moves around in the now familiar twin-stick shooter style game, as you blast away other brightly colored ships and shapes on a stark black background filled with psychedelic effects and particle explosions. It’s only sort of retro, as nothing even remotely close to it could have been made back in the days of quarter-munching arcade machines. It’s addictive, and it’s hard. Very hard. So, what has changed? Quite a bit. Game design and graphics — Dimensions makes three major changes to the formula. The first of which is the playfield. In the past it was just a flat rectangle that was always just a little bigger than your screen, so that there was always something you couldn’t quite see. Now, however, the gameplay takes place on shapes that are sometime flat, sometimes three-dimensional and which exist on top of the traditional background. This allows for some wild effects and a lot of variety in the layouts of the levels. It seems like Lucid should license off the engine to create a simulator to teach people about multiverse theories. Also, this game is gorgeous. The effects are simply mesmerizing, and the new approach to level design keeps things constantly moving. Little ideas introduced in each new level had me laughing to myself at the overall cleverness and craziness of what I was experiencing — when I could stay alive long enough to enjoy it. The campaign — The second major change is an adventure mode in which you progress through different levels earning stars. There are a large variety of levels available, and they draw from the different modes fans loved in the previous Geometry Wars games but mixes them up with different goals and alternating map layouts. Just like in many other modern games, clearing a level with the lowest rating (one star) is enough to move forward, but you’ll eventually need to backtrack and earn two or three stars to unlock further levels, as well as power-ups. Speaking of which, the power-ups are the third change to the formula. Weapons and power-ups — In the past, you had your main gun that you shoot with the right stick and a limited number of bombs that could be set off with the right trigger. Here you also have a variety of upgradeable super moves that are activated with the left trigger, as well as drones that help you in battle. As you unlock the different drones and super moves, you can mix and match them with your favorite playing style. The first drone is a straightforward sidekick that shoots in the same direction that you’re shooting in, while the second one gathers multipliers for you so you can focus on blasting baddies. Super moves have a wide variety too. The first one you unlock sends your drone off to lay mines across the screen that can only hurt enemy ships. It’s a real lifesaver when you’re in the middle of shooting a few dozen enemies in one direction and aren’t going to have time to turn around to shoot the dozen coming from another direction. The music and sound — An absolutely top-notch soundtrack is matched by perfect sound design. The electronica beats and space blasting sound effects add to the fun and will help convince you to keep playing after you’ve died for the dozenth time in a row. Did I mention the game is hard? — Let’s put it this way: on my first night of playing, I got to 14 stars. I needed to hit 16 to unlock the next section of levels, so I went back to collect more on the earlier levels. Hours later and no such luck…days later and, again, no such luck. Getting one star on any of these levels is tough but entirely doable. Getting two stars is an absolute nightmare. On one level, “The Sausage,” I managed to get through the entire two-minute countdown without getting killed once, while constantly blasting enemies the entire time and picking up loads of multipliers. Yet I was still about 40,000 points away from getting two stars. I’m not even sure how it’s possible to get three stars, so what was left to do? Grind. The grind — Yes, while the upgradeable power-ups are a great addition to the game, they do introduce the somewhat annoying necessity to grind. Even if you don’t manage to get the stars you’re aiming for, you still get points that are used towards upgrading your super moves and drones, so you might as well just grind until you’re powerful enough to beat these levels with less effort. That is, unless you’re some kind of half-human, half-robot hybrid that’s able to beat these things without a problem. All this talk about difficulty is not to say I didn’t like the game. 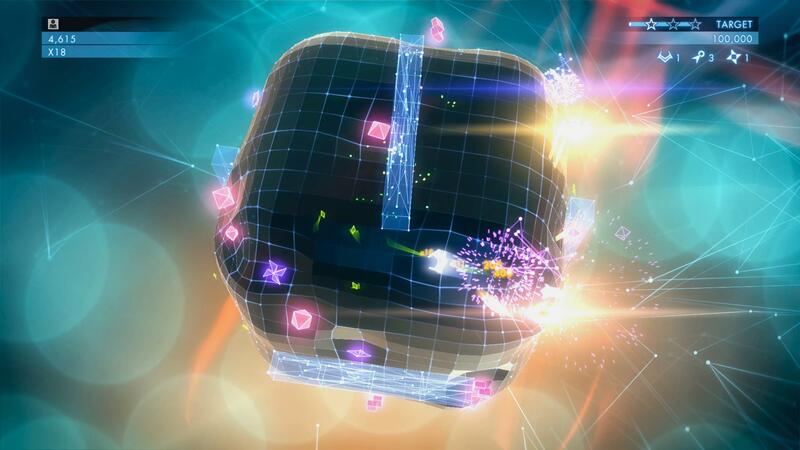 Geometry Wars 3 is an absolute blast. The online leaderboards that have always been a huge part of the series are still there, and there’s an entire Classic Mode menu filled with the various modes that were in Geometry Wars: Retro Evolved 2. There is plenty to do, and it’s all incredibly fun. Hard but fun.